that will compete with any other." Sound "Uncanny ease along with an amazing sense of liquidity"; "midrange and high frequencies are simply marvelous"; bass is "tighter and better controlled" than with the original Capitole CD player. Features STARS 24-bit/192kHz resampling; tubed output stage; built-in volume control allows for elimination of the preamp. Use Sounds best when run directly into the amp. Value "For those looking for the ultimate in CD playback and have the money to make the journey, the Audio Aero Capitole 24/192 may well be it." 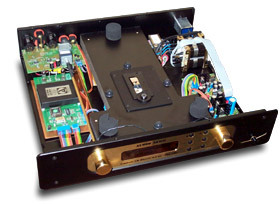 I reviewed the Audio Aero Capitole CD player in June of last year. Anyone who knows me or has read the review knows how much I think of the player. Even today, as more and more new-format digital players hit the market, I still turn to the Capitole as a point of reference. Its liquid magic and tube-smooth nature give it an eminently musical presentation that few, if any, players can match. But Audio Aero doesnt sit on its hands. This France-based company may not be a large manufacturer, but it certainly does churn out its share of new products. When I was just finishing up my review of the Capitole, I learned of a newer and supposedly better version coming to market. No, this would not necessarily replace the older Capitole, but it would give the opportunity for those who like the Capitole's sound to get all that and more. However, the improvement does come at a cost. The original Capitole can be had for $4200 USD, while this one, dubbed the Capitole 24/192, retails for $6200. Cosmetically the two Capitole players are identical, except that this one is marked "24/192" on its front plate. It's a large and attractive design that most will find elegant. It definitely doesnt look like a run-of-the-mill CD player like so many others I see. At its heart again is a Philips CDM12 transport mechanism mounted on an MDF platform. This is a top-loading design that requires you to place a little "puck" on top of the disc once it's inserted into the player. The real changes come in the implementation of the digital and analog sections. Bucking the current trend, this CD player features resampling, not upsampling. What's touted here is the 24-bit/192kHz STARS (Solution for Time Abstraction Re Sampling) resampling process developed for Audio Aero by the Swiss company Anagram Technologies SA. This system is totally independent from the input clock, so free of jitter, and it involves "a combination of very high-speed resampling, interpolation and signal-enhancement techniques." 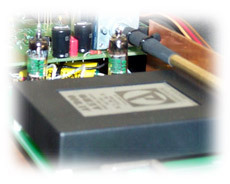 Analog-to-digital conversion is done by an Analog Devices AD1853JRS 24-bit/192kHz DAC, while digital processing is handled by a 32-bit floating-point SHARC chip. Like the original Capitole CD player, this one uses a tubed output stage, but as with the digital section, this, too, has changed significantly. Among other things, it uses whats called a 6021W subminiature tube. I made a point of looking at the tube to see exactly what it is. As the name implies, its tiny. According to the companys specs, the player can swing up to 4.5V via its outputs. Users can choose between single-ended or balanced outputs. I used the single-ended outputs with my hyper-revealing Nordost Quattro-Fil interconnects. Like all the Audio Aero CD players, this one has an analog volume control that can be adjusted via the front panel or the remote (its motorized). This built-in volume feature should not be underestimated. It allows for the possibility of eliminating the preamplifier in your system and driving the power amp directly (providing that you dont need the switching capability of a preamplifier). Its possible that reduction of a component in your system may improve sound quality -- it did for me. At first, I mistook the digital connectors on the back as outputs -- theyre not! There are two inputs, one BNC and one coaxial, that accept word lengths from 16 to 24 bits at sampling frequencies up to 96kHz, should you wish to hook up another digital source and use the fantastic-sounding guts this player has. However, I used it as a stand-alone player and didnt experiment with these inputs. Finally, the company seems to have listened to some previous criticism and replaced the flimsy plastic remote control that comes with their other players with a mega-functional, fully programmable remote with an LCD front panel. It will be a welcome addition for some, but others may be crying for the cheap little one again since this new one takes a bit of effort to figure out. The owners manual dedicates more pages to operating the remote control than the CD player! Count on a somewhat steep learning curve. From the get-go, I could tell that this CD player was something very special. It does almost everything the standard Capitole does and then some. I say "almost," because there is a slight variation, and thats what Ill touch on first. What really set the original Capitole apart from much of the crowd was its robust, fleshed-out sound. Some may call it tubey. Whatever you want to call it, the result is the same -- a full, rich sound that comes across as incredibly natural. Voices have excellent weight and definition, instruments have a rich and textured presentation, and music on the whole has a vibrant and lifelike sound. This Capitole 24/192 doesnt have quite the bloom the other one does and doesnt project the stage as far forward as the original. The sound is still full and rich with a silky-smooth texture, but it's just not quite as robust and bloomy. Frankly, that will probably be welcome on all but the most dry and sterile of systems. Loudspeakers  Axiom M3Ti, Cliffhanger CHS-2/W-2, JMlab Chorus 706, PSB Image 2B, Revel Performa M20. Digital  Resolution Audio CD55, Simaudio Eclipse. As for the rest of the performance, as I mentioned, this player improves on every other aspect of the original Capitoles sound. Bass through the original Capitole was good, but with the 24/192 player it's slightly tighter and better controlled. The Simaudio Eclipse can still win in terms of all-out slam (and over every other player Ive listened to, as a matter of fact), but this one is closer and compares favorably to all the top dogs out there. Whats offered here has better weight, definition and articulation through the lower registers. Audiophiles who have this player wont feel theyre being shortchanged one bit. Midrange and high frequencies are simply marvelous. Both Capitole players have an uncanny ease along with an amazing sense of liquidity that Ive just not heard from any other player. I like to listen to Bruce Cockburns voice for comparison between players. On his better recordings, particularly those with close miking, there tends to be a very deep and rich presentation with loads of detail. Put on The Charity of Night [Rykodisc CD 0366] from 1999. On some systems it can sound just a little bit too warm and chesty. On others it can sound a tad cold and hard. Here it sounds spot-on. Guitar is also a good test. The plucking of strings can exacerbate some nastiness in some players. I used another Cockburn recording, the stellar Humans [Columbia CK48748] released in 1980. This album marked the turning point of Cockburn using purely acoustic guitar and moving into the electrified world. "Fascist Architecture" is a short and simply produced song consisting primarily of just his guitar and voice. The Capitole 24/192 has tremendous detail and articulation without the hashy splashiness that plagues some players. It has the musicality of analog without any of the drawbacks. Need to finally replace your turntable? Finally, resolution is something at which the original Capitole didnt really excel, and this was my biggest criticism. When I compared that player to the slightly more expensive Simaudio Eclipse and the much less expensive Bel Canto DAC1, I found that I could not quite hear into the recording in the same way with the Capitole. Both those units revealed more information in the recording and, as a result, tended to display more soundstage depth and spaciousness. That problem is gone. In terms of resolution and detail, the Capitole 24/192 is now among the very best Ive heard. I just had in-house the excellent Resolution Audio CD55 CD player (unfortunately, due to parts-supply problems, the player is not available at this time). After listening to CD after CD on it, I learned of its ability to seemingly unravel everything on 16/44 discs. It makes for an excellent point of reference for what you should expect from top-notch CD playback. An album that I enjoy pulling out to test resolution is Ennio Morricone's soundtrack to the movie The Mission [Virgin CD 90567-2]. I've always liked the music on this album (primarily choral), but what has surprised me most is just how much more information is embedded in the pits than I originally thought. In the late '80s and early '90s, I always used it as a reference when upgrading components to see how much more I could hear into my system. I thought, frankly, that I'd heard all I would ever hear from it -- particularly because it is only a so-so recording in many ways. The Capitole 24/192 and the Resolution Audio player move it another surprising leap forward -- with even more depth, better delineation of voices and instruments, and better rendering of ambient cues. The CD55 and Capitole 24/192 are neck and neck, both exemplifying the best of what modern-day CD playback is about. Both Audio Aero Capitole CD players make music. What sets them apart from many competitors is their incredibly natural and musical presentation. If you think digital, particularly CD, sounds dry and sterile, then listen to these players. They are as smooth, sultry and sweet as the finest analog and, quite simply, two of the best CD players Ive heard. In fact, CD players like this dont even have me wanting for DVD-A and SACD. As for the comparison between the two players, suffice it to say that the Capitole 24/192 is a step ahead of the original Capitole. As I mentioned, I loved the original Capitole, but I had a few reservations -- things that, if fixed, I knew would lead to Audio Aero having a simply outstanding player on their hands, one that could stand up to anything when judged purely on sound quality. Audio Aero has done this. The Capitole 24/192 is a seriously great-sounding CD player that will compete with any other. However, one caveat must still be made -- its a very expensive player and it doesnt play anything other than CDs. But the pursuit of the state of the art has rarely been an exercise in cost effectiveness and high value. And thats what this player is about. For those looking for the ultimate in CD playback and have the money to make the journey, the Audio Aero Capitole 24/192 may well be it.